I spent this past weekend surrounded by some of my favourite people, doing some of my favourite things. The weekend kicked off with a delicious home cooked meal by N, with more Cumbrae's steak then one should eat in a month. Once the girls arrived, it was time for ginger beer marguerites and BBQ s'mores (yes, that's a thing). 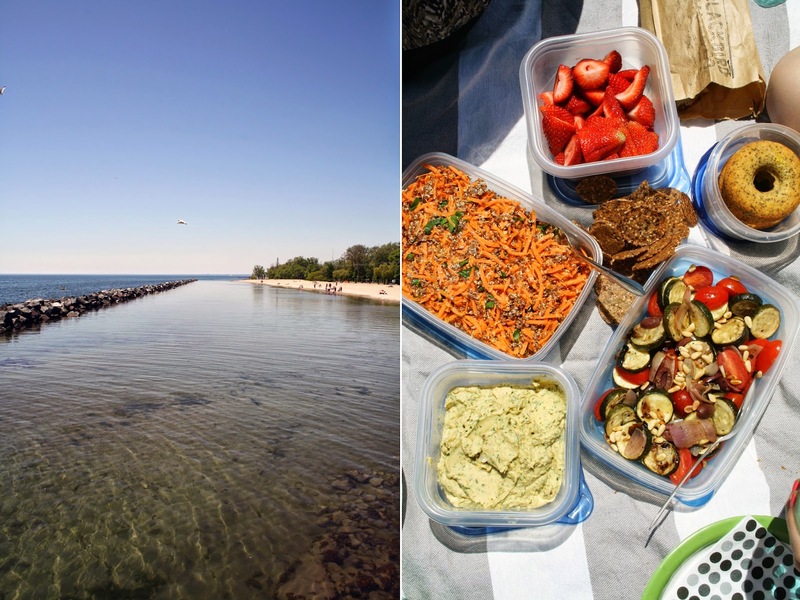 Saturday's weather could not have been more perfect, and we spent the day at the beach, lounging in the sun and stuffing our faces (see below). As the sun set, we sipped on some bubbly and then headed off to a phenomenal dinner at Campagnolo, followed by far too many dark and stormies and the strongest jameson and coke I've ever consumed. Sunday brunch was divine, followed by an equally delicious dinner - rounding off the weekend with far too much food, and possibly a little too much to wine - but that's what birthdays are for, right? 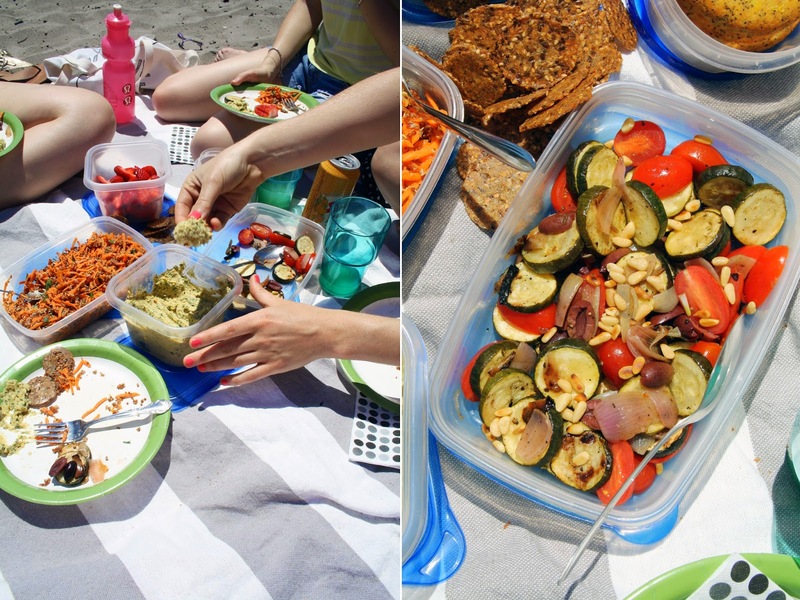 Spending the day at the beach meant lunch had to pack well, keep up in the heat and be light, refreshing and satisfying. This simple combination of dishes definitely did the trick! Lemon & Herb Hummus adapted from Sprouted Kitchen's cookbook; lemony and herby in all the best ways - served with mary's crackers and a phenomenal sourdough baguette. Carrot Salad with Tahini adapted from Smitten Kitchen, swapping out the chickpeas for 1 cup of quinoa. Grilled zucchini and tomato salad - recipe below. Gluten Free Lemon Poppy Seed Donuts from Ashley's cookbook; because it wouldn't be a birthday without doughnuts! And the post sun, afternoon snack (not pictured here): totally delicious Avocado + Caper Tartare and perfectly boozy and celebratory Kir Royale. Toss the zucchini rounds and shallots with lemon juice, oil, salt and pepper. Barbecue on medium heat for 10-15 minutes. (Alternatively, toss in a 400 degree oven for ~15 minutes). While the zucchinis are grilling, combine the tomatoes and olives in a bowl. When the zucchini and shallots are ready and still hot, transfer to the bowl and toss to combine. The flavours from the grill will transfer to the other veg while their hot. Before serving, toss in the nuts. Taste and add more lemon juice, salt and pepper as required.